Blogging, recording, remembering - whatever you want to call it - can sometimes make a "vacation" a real drag. Last year, I was determined to write a post for every day that we were in Spain. I was able to pull it off, but it was a ton of work, and didn't really contribute to the quality of my vacation time. This time around in Madrid, I wanted to soak it all in. And soak we did: in tapas and wine, in the Arab baths, and in the sunshine. Instead of trying to day trip out to Segovia or Toledo again, we just stayed put. Our AirBnB flat ended up having the perfect location: directly above an incredible tapas bar, El Alambique. We ate there at least once a day - sometimes twice. 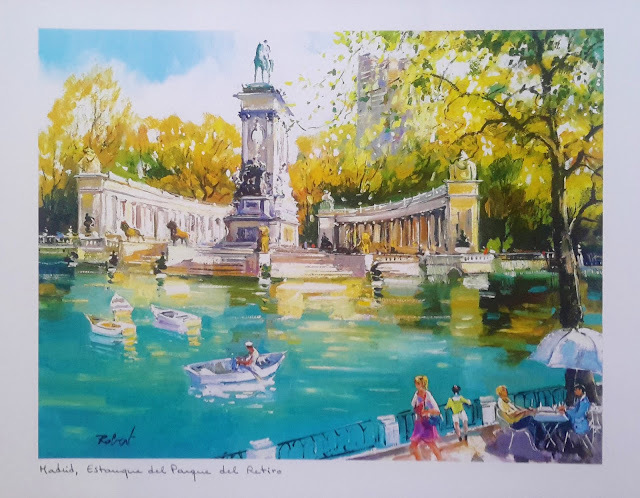 Besides my "goal" of taking it easy, the other thing I really, really wanted to do was float around in a rowboat in Retiro Park. We had entirely coherent conversations in Spanish on several occasions...we are still trying to figure out how that happened. We sat back and relaxed at the new Star Wars movie (ask Marc how this came about) - and only paid $6 each to see it. We repeated our favorite tapas bar from last year, only to realize we loved our new tapas bar even more. We waited in line for the legendary Melo's tapas and even found a place to sit and enjoy the insane zapatilla (a giant grilled ham and cheese sandwich). We refreshed in the Hammam Al-Andalus again. We wandered through the beautiful paintings of Paris and Venice in the Thyssen museum. We sat in the sunshine whenever we could. Basically, it was a perfect vacation. We are die-hard Spain fans. When we visited Spain while living in France (I'm taking a moment to sigh at that opening statement - living in Europe is SO cool), it was like, "Hey, Spain is really great." After living in Germany for the past four months, Spain is now, "OMG this is amaaaaaaaziiiiiing." Pork with grilled onions and mango with brie cheese tapas. But aside from the food, we noticed things we had taken for granted in France before: free tap water, free toilets, free strong wifi...all things we never expected the most successful country in the European Union to not have figured out already. Spain may have a lot of other economic issues, but basic needs in the 21st century is not one of them! If you ever get the opportunity to enjoy Madrid, do whatever it takes to go row a boat in Retiro Park. It's just plain and wonderful fun. While we are by no means art collectors, we do try to find something from places that we love for our walls. Now we can soak up the sunshine in Retiro Park anytime we want. Have you been to Madrid? Do you love Spain as much as we do? How do you celebrate Christmas and other holidays when you are abroad?